“Early in the morning, as He was returning to the city, He was hungry. Seeing a lone fig tree by the road, He went up to it and found nothing on it except leaves. And He said to it, “May no fruit ever come from you again!” At once the fig tree withered. 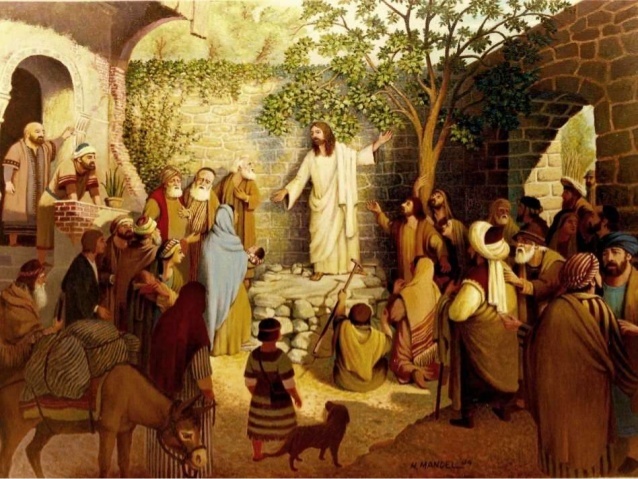 Jesus found the Temple far from God and wholly dedicated to the material world; the priestly class, with their majestic, priestly attire was like the fig tree, full of green leaves, but barren of Godly fruits. Jesus was hungry and the tree was full of leaves, the fig tree needed fruits, but it produced none. Jesus was hungry to see the faith of his people, to witness their desire for the fruits of the Heavenly Kingdom, but He failed to find those who “loved God with all their hearts, with all their souls and with all their strength,” (Deuteronomy 6:5). A fruitless fig tree is an example of fruitless priests and rulers, fruitless Temple, fruitless Church, and also fruitless Christians. Barren Christians who spend time in the Church and read the Word of God, but disregard it and live in the fallen world. Christians who love more their sin and selfishness, than love God, living separated from sin and loving their neighbors. “For we must all appear before the judgment seat of Christ, so that each one may receive what is due for what he has done in the body, whether good or evil,” (2 Cor 5:10); “But because of your hard and impenitent heart you are storing up wrath for yourself on the day of wrath when God’s righteous judgment will be revealed. He will render to each one according to his works: to those who by patience in well-doing seek for glory and honor and immortality, he will give eternal life; but for those who are self-seeking and do not obey the truth, but obey unrighteousness, there will be wrath and fury. There will be tribulation and distress for every human being who does evil,” (Romans 2:5-12). Jesus contrasts the judgment of the barren fig tree, with the faith in God that makes everything possible: “For nothing will be impossible with God,” (Luke 1:37). We must ask the Lord in prayer with faith, believing in Him and not doubting, that we can bear abundant fruit; We must ask the Lord to give us the strength and the courage to share the Gospel with others, despite the difficult circumstances we Christians are living to share our faith. There cannot be fruitful prayer without a faith that has its roots in Jesus our Lord and Savior and His Word: “So faith comes from hearing, and hearing through the word of Christ,” (Romans 10:17). ” What good is it, my brothers, if someone says he has faith but does not have works? Can that faith save him? If a brother or sister is poorly clothed and lacking in daily food, and one of you says to them, “Go in peace, be warmed and filled,” without giving them the things needed for the body, what good is that? So also faith by itself, if it does not have works, is dead. But someone will say, “You have faith and I have works.” Show me your faith apart from your works, and I will show you my faith by my works. You believe that God is one; you do well. Even the demons believe—and shudder! Do you want to be shown, you foolish person, that faith apart from works is useless? Was not Abraham our father justified by works when he offered up his son Isaac on the altar? You see that faith was active along with his works, and faith was completed by his works; and the Scripture was fulfilled that says, “Abraham believed God, and it was counted to him as righteousness”—and he was called a friend of God. You see that a person is justified by works and not by faith alone. And in the same way was not also Rahab the prostitute justified by works when she received the messengers and sent them out by another way? For as the body apart from the spirit is dead, so also faith apart from works is dead,” (James 2:14-26). Next Holy Week Meditations. Holy Wednesday. Judas Agrees to Betray Jesus.